The U.S. has more trees today than 70 years ago. In fact, 1.6 billion seedlings are planted in the U.S. every year – the equivalent of 4.4 million trees every single day of the year. Modern forest management ensures not only that felled trees are replaced, but that every year more wood is grown in U.S. forests than is harvested. According to The State of America’s Forests report, responsible forest management has resulted in more than 50 consecutive years of net forest growth that exceeds annual forest removals. As trees grow, they absorb carbon dioxide (CO2) from the atmosphere and release oxygen (O2) back into the air. Softwood produ cts store much of this carbon indefinitely. 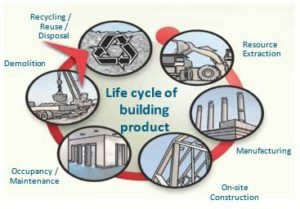 In the case of buildings, the carbon is kept out of the atmosphere for the lifetime of the structure—or longer if the softwood is reclaimed and used to manufacture other products. It is the only mainstream construction material that is renewable and produced using solar energy. It has better insulation properties than other building materials. Trees require less energy (meaning less CO2 emissions) to harvest and convert into finished products than any other construction material. Wood is reusable, recyclable, can be used as biomass fuel and is biodegradable. Wood is better for the environment than fossil fuel-intensive materials such as steel or concrete in terms of embodied energy, air, and other environmental impact categories. The Sustainable Forestry Initiative (SFI) Inc., an independent, non-profit organization dedicated to promoting sustainable forest management and working to ensure the health and future of North American forests through the development and oversight of sustainable forest management standards. Since 1995, SFI program participants have directly invested nearly €5 billion ($1.6 billion) in forest research. In 2015, three-quarters of this investment was allocated to conservation-related objectives. Every year, millions of hikers, birdwatchers, campers, and other outdoor enthusiasts use forestlands that are certified to the SFI standard. And the amount of forests certified to SFI available for recreation has more than tripled since 2007. More than 50 percent of the nation’s drinking water originates from forested landscapes, and state forestry agencies are partnering with industry to safeguard this valuable resource. The USDA Forest Service’s Urban and Community Forestry Program provides support to communities to establish and manage their trees and forests. The program helps keep green infrastructure healthy and productive, which directly benefits the more than 220 million urban-dwelling Americans while also providing landscape-wide benefits to water, air, and wildlife resources. The forest products industry in the United States employs nearly 900,000 people, exceeding employment levels in the automotive, chemicals, and plastics industries. The wood manufacturing segment accounts for more than a third of those jobs. Softwoods have been exported from the United States for nearly 250 years. Today, the U.S. is recognized worldwide as a sustainable source of top quality timber. 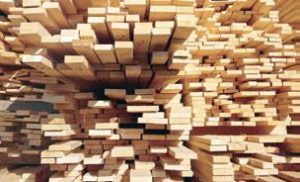 America’s forests currently produce over 80 million cubic metres (105 cubic yards) of sawn timber a year, making them the largest producers in the world. About 10 percent of this timber is exported overseas. 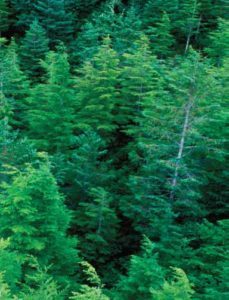 Although 23 million hectares (57 million acres) of private forests are expected to face significant development pressures over the next 20 years, strong markets for softwood products provide a financial incentive for landowners to invest in their forests and keep them healthy for future generations.